Staling is the decrease in the palatability of baked goods that does not include microbial contamination. 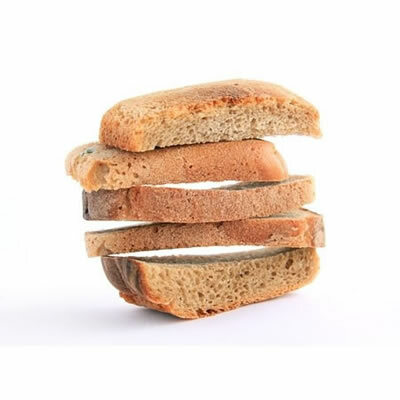 A major problem in the baking industry, it is a change in both chemical and physical attributes that give bread products a dry, leathery texture. Staling in baked products is caused mainly by starch retrogradation.1 Starch retrogradation is the recrystallization of the starch molecules. Other theories of gluten cross-links in the structure of the baked product together with moisture re-distribution, have also been proposed. A common misconception is that bread goes stale from a simple loss of moisture. In fact, it can happen without appreciable loss of moisture. However, loss of moisture from the loaf may accelerate reactions leading to it. Processing Factor – lower baking temperatures11 and larger loaf volumes12 reduces it. Enzymes – alpha amylase,5 pullulanase,13 lipase,14 lipoxygenase,15 protease16 and other non starch polysaccharide-modifying enzymes17 help decrease staling. Surface Active Lipids – DATEM, SSL, Lecithin18 and Monoglycerides19 decreases it. Ingredients – Many bread recipes call for the addition of fat, wheat gluten, and high protein flour. Sugar is another common addition utilized to prohibit staleness by helping to retain water in the bread and disrupt the cross-links. Other Ingredients – shortening20 and gums/hydrocolloids7 decrease staling. In addition, freezing bread to very low temperatures can stop the staling process. Bakers have several uses for stale bread such as bread pudding, French toast and croutons. Cake staling is very similar to bread in the chemical and physical process. However, cake staling is usually slower given the higher volumes, high fat, and high sugar in the initial formulas. Hug-Iten, S., F. Escher, and B. Conde-Petit. “Staling of Bread: Role of Amylose and Amylopectin and Influence of Starch-Degrading Enzymes.” Cereal Chemistry 80.6 (2003): 654-61. Chinachoti, Pavinee, and Yael Vodovotz. Bread Staling. Boca Raton, FL: CRC, 2001. Katz, Johan Rudolf. A Comprehensive Survey of Starch Chemistry. New York: Chemical Catalog, 1928. Erlander, Stig R., and Leatrice G. Erlander. “Explanation of Ionic Sequences in Various Phenomena X. Protein-Carbohydrate Interactions and the Mechanism for the Staling of Bread.” Starch – Stärke 21.12 (1969): 305-15. Martin, ML, and RC Hoseney. “A Mechanism of Bread Firming. II. Role of Starch Hydrolyzing Enzymes.” Cereal Chemistry 68 (1991): 503. Web. Kim, SK, and BL D’ Appolonia. “Bread Staling Studies. III Effect of Pentosans on Dough, Bread, and Bread Staling Rate.” Cereal Chemistry 54 (1977): 225. Davidou, S., M. Le Meste, E. Debever, and D. Bekaert. “A Contribution to the Study of Staling of White Bread: Effect of Water and Hydrocolloid.” Food Hydrocolloids 10.4 (1996): 375-83. Kulp, Karel, J. G. Ponte, and Bert L. D’appolonia. “Staling of White Pan Bread: Fundamental Causes∗.” C R C Critical Reviews in Food Science and Nutrition 15.1 (1981): 1-48. Aguirre, Juan FranciscoF, Carlos Alberto Osella, Carlos Roberto Carrara, Hugo Diego Sánchez, and María Del Pilar Buera. “Effect of Storage Temperature on Starch Retrogradation of Bread Staling.” Starch – Stärke 63.9 (2011): 587-93. MacMasters, MM. “Bakers Digest.” Starch Research and Baking 35.5 (1961): 42. Axford, D. W. E., K. H. Colwell, S. J. Cornford, and G. A. H. Elton. “Effect of Loaf Specific Volume on the Rate and Extent of Staling in Bread.” Journal of the Science of Food and Agriculture 19.2 (1968): 95-101. Carroll, JO, COL Boyce, TM Wong, and CA Starace. Bread Anti Staling Method. Patent 4654216. 1987. Qi Si, J. “Synergistic Effect of Enzymes for Breadbaking.” Cereal Foods World 42 (1997): 802. Van Eijk, JH, and JD Hille. “Nonamylotytic Enzymes.” Baked Goods Freshness: Technology, Evaluation, and Inhibition of Staling. By Ronald E. Hebeda and Henry F. Zobel. New York: Marcel Dekker, 1996. N.
Mathewson, PR. “Enzymatic Activity during Bread Baking.” Cereal Foods World 45 (2000): 98. Rodionova, NA, AY Kilimnik, LV Kaprel’yants, PV Serednitskii, LI Martinovich, NA Zagustina, and AM Bezborodov. “Enzyme Preparations from Mycelial Fungi That Cleave Cereal Grain Polymers.” Applied Biochemistry Microbiology 31 (1995): 433. Forssell, P, S Shamekh, H Härkönen, and K Poutanen. “Effects of native and enzymatically hydrolysed soya and oat lecithins in starch phase transitions and bread baking.” Journal of the Science of Food and Agriculture 76.1 (1998): 31-38. Huang, JJ, and PJ White. “Waxy Corn Starch: Monoglyceride Interaction in a Model System.” Cereal Chemistry 70 (1993): 42. Rogers, DE, KJ Zeleznak, CS Lai, and RC Hoseney. “Effect of Native Lipids, Shortening, and Bread Moisture on Bread Firming.” Cereal Chemistry 65 (1988): 398. Ghiasi, K., RC Hoseney, K. Zeleznak, and DE Rogers. “Effect of Waxy Barley Starch and Reheating on Firmness of Bread Crumb.” Cereal Chemistry 61 (1984): 281. Hoseney C, and R. Miller. Current understanding of staling of bread. AIB Research Department Technical Bulletin. 20(6):1 (1998).